Logo on autos. bronze-like molded plastic. 2 1/2 inches long. 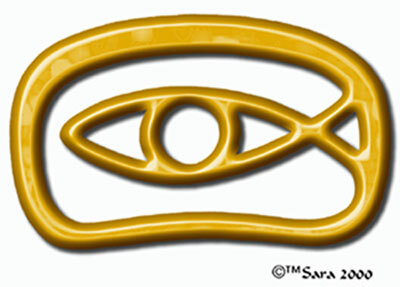 Sara Mall Johani designed the Soul Salmon logo to draw attention to the keystone species of the region, namely salmon. It is proposed that regional inhabitants display a logo visible on the rear of their vehicles similar to the fish logo variations currently popular. This logo signifies that the owner is one of the "Salmon People".